Separation of Offices from Residences. 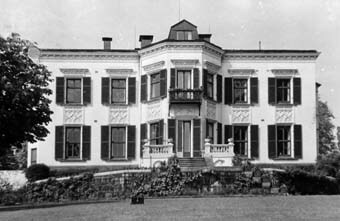 More Mission houses were bought in the decades before and after the First World War: Oslo in 1906 (23); followed by Bucharest, Berne, Budapest, Prague, and, in 1925, Helsinki – all good Mission Houses, more than half of them still in the estate. And several Mission Houses were built at this time, all still in the estate: Mexico City in 1912, Sofia in 1914 and Stockholm in 1915 (24). UK staff numbers overseas increased dramatically after the First World War. This put great pressure on space, as chanceries grew like cuckoos in their Mission House nests. 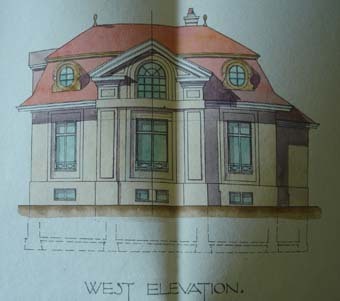 Responses to this pressure took various forms: leasing overflow office space close by; designing larger chancery areas into new houses; building overflow office space in the garden, as at Berne (25); and, eventually, as in Tokyo in 1930 (26), building free-standing chancery buildings in compounds. Heads of Mission were delighted to see their non-chancery staff leaving the Mission House. But they were utterly opposed to losing their chanceries: they could not tolerate the thought that officers would be unable come to their study upon immediate summons or that the Head of Mission might have to drive to the office. 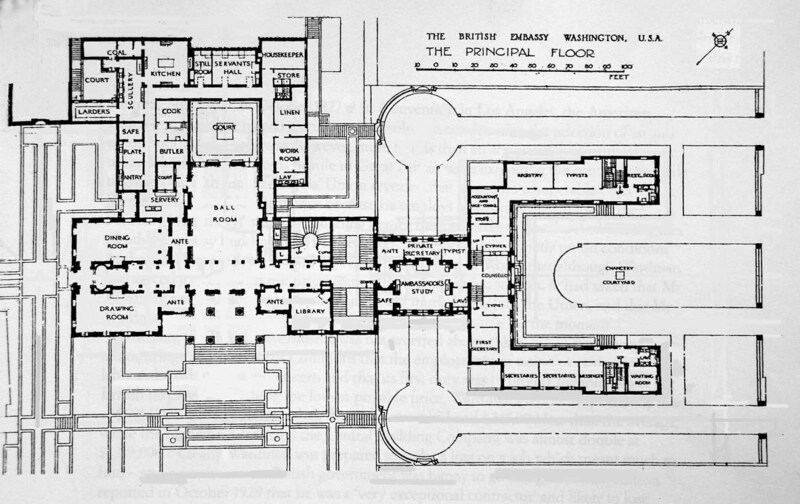 Lutyens, incidentally, produced a wonderfully elegant compromise in his Washington ensemble of 1930 (27). 27. Washington. The residence on the left, looking south, and chancery on the right looking east, the study poised between the two. Thus began the separation of offices from residences, therefore the demise of the Mission House, and the arrival of the single-purpose residence building. Experiences during the Second World War speeded up the separation process. Some Head of Missions moved out of their houses entirely – to make room for new offices; others retreated to corners and attics as their drawing rooms became registries; and office extensions and prefabs were thrown up in gardens and courtyards. As a result, the policy was adopted just after the War that offices and residences should be permanently separated at all Posts. Decisions therefore had to be made about which of the Mission Houses were to be used for which sole purpose. Some became offices alone and the residences went elsewhere (like Brussels, Bucharest and Mexico City). Others became residences alone and the offices went elsewhere (like Lisbon, Montevideo and Paris – though the offices only had to move next door in Paris). These separations inevitably led to some tortuous office plans and some overlarge residences. Some of these residences are still with us. It has always been hard to decide whether to accept this as the Price of Presence or to downsize to escape the syndrome knOWn as Kennel Wagging Dog. The demand for more accommodation rose steeply after WWII. It was caused by catching up with the wartime backlog; by the decision to separate offices and residences; by numerous new Posts resulting from colonial Independences; and by the decision to provide residential accommodation for all UK-based staff. 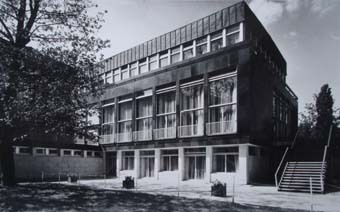 The Ministry of Works, as the Office of Works had now become, and Foreign Office faced a huge task. Much of the demand was met, in the first instance at least, by buying and leasing accommodation. But a large building programme was also necessary. 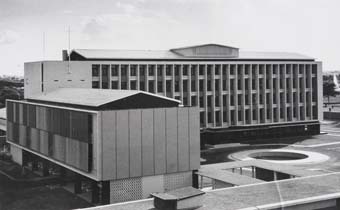 Between 1950 and 1970 Ministry of Works designed and built over 20 significant offices. Two examples: New Delhi completed in 1962 (28), and Buenos Aires in 1968 (29). And Ministry of Works built at least 20 residences, like Colombo in 1954 (30) and Warsaw in 1964 (31). The explosion of residential accommodation for UK-based staff was epitomised in the 24 acre compound at New Delhi, completed in 1962 (32). 23. Oslo. 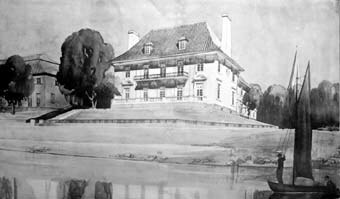 Villa Frognaes, built for Thomas Heftye in the 1850s. A fine house in large grounds overlooking the fjord. 24. Stockholm. 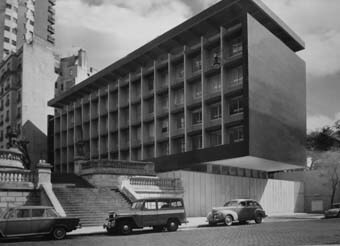 Designed by Richard Allison, who later became the OW’s chief architect. 25. Berne. 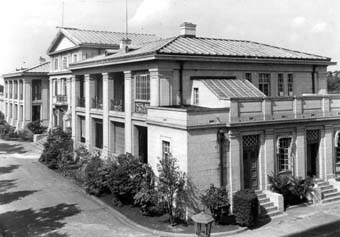 Built in 1913 in the garden of the legation house, this was the first freestanding chancery to be built in Europe. It contained chancery offices on the ground floor, archives and residence laundry in the basement, and an archivist’s flat in the roof. 26. Tokyo. Freestanding building with offices on the ground floor, and flats above. The ambassador still found himself being expected to pay for the office building’s running costs. 28. New Delhi. Almost all the new offices buildings had concrete frames, central double-banked corridors, chanceries and registries at the top, publicly accessible offices at the bottom, and a couple of Security Officers’ flats tucked into one end. 29. Buenos Aires. Though these buildings were neither dramatic nor beautiful, most remain fully operational. 30. Colombo. 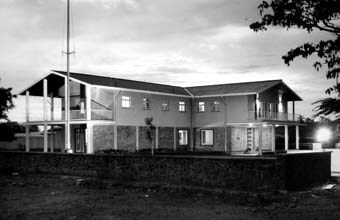 The first non-traditional residence to be built. It looks much better now that it is enveloped in greenery. 32. New Delhi. An enormous building project with three blocks of married staff flats; one of bedsits for singletons; messes, clinic, club, sports hall, and other recreational facilities; and extensive local staff quarters.